Three pinks with personality, from sweet to punchy to bling, bling, bling. It’s nearly February. That means the Limited Edition Formula X ColorCurator 2016 Collaboration with Patrick Starr will be available at Sephora on Friday! If you haven’t heard about this series of shades, check out the January 2016 Aimee Song ColorCurator post for all the pertinent information. This month belongs to Patrick Starr. He’s a powerhouse beauty vlogger on Instagram, Twitter, and YouTube, and from what I can see, he’s a fan of the same kinds of pinks I am. 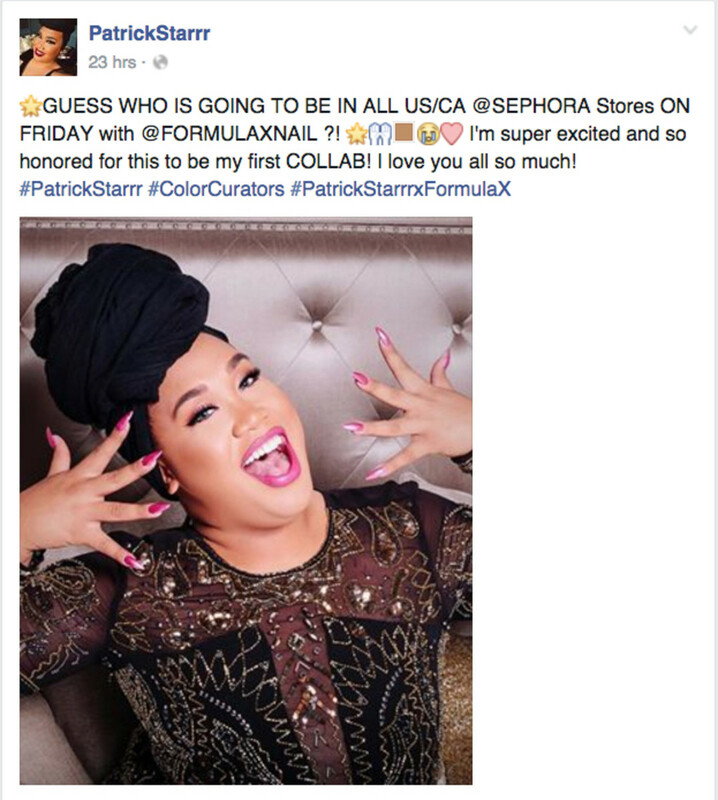 Formula X She Better Werk – Patrick Starrr LE Feb 2016 (above). This springy pink is popping up all over the place this season and I’m glad it is. It’s one of those pinks that’ll look great on every one. Two easy coats to perfection and there’s no top on there. Formula X Lucky Starrr over She Better Werk – Patrick Starrr LE Feb 2016 (above). Oooh! A glittery pink thing I can use as a top coat? Okay! That’s a single coat of Lucky Starrr over She Better Werk and it’s so pretty I can barely stand it. Formula X Yazzz – Patrick Starrr LE 2016 (above). There’s something about a saturated bubblegum pink that gets me every time. I just LOVE this shade. The fact it’s again two simple coats makes it a winner. Formula X Lucky Starrr over Yazzz – LE 2016 (above). And if you slap your Lucky Starrr over your Yazzz, it’ll look just like that. 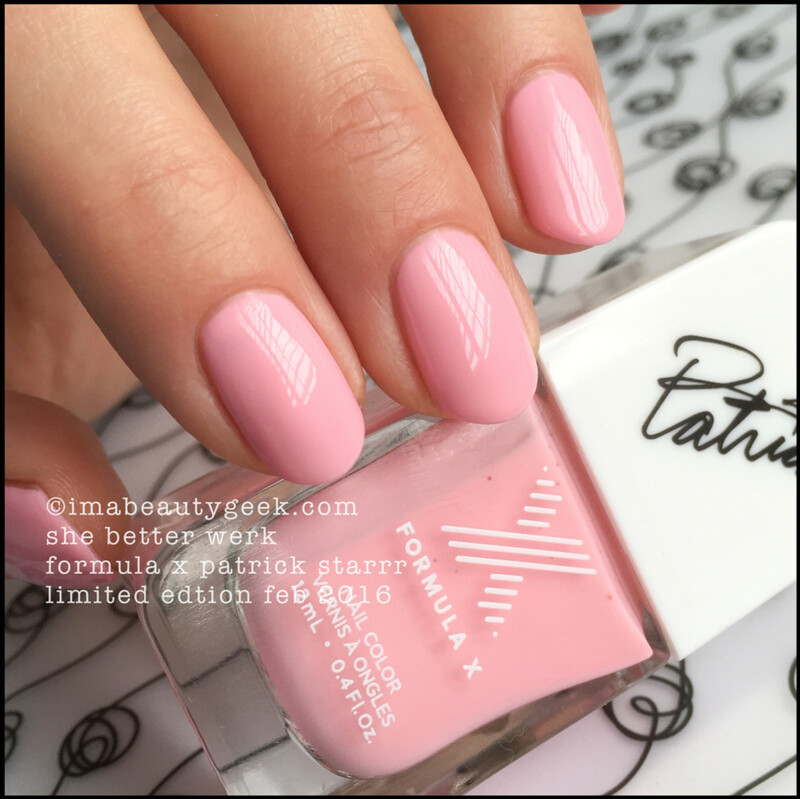 Formula X Lucky Starrr – Patrick Starrr LE Feb 2016 (above). That’s two coats of Lucky Starrr straight up. You can get exactly the same look using Yazzz as your undies and if I were you, I’d choose that route simply to make removal a tad easier. I love these hot pink glittery things. This one is very mildly textured so you’ll want to add a top coat for added blingy-ness. The Formula X Patrick Starr #ColorCurator collection is a February 2016 exclusive available in-store and online only at Sephora .com. Next month, keep your eyes peeled for the March shades. I’ve seen the future and it’s very pretty!